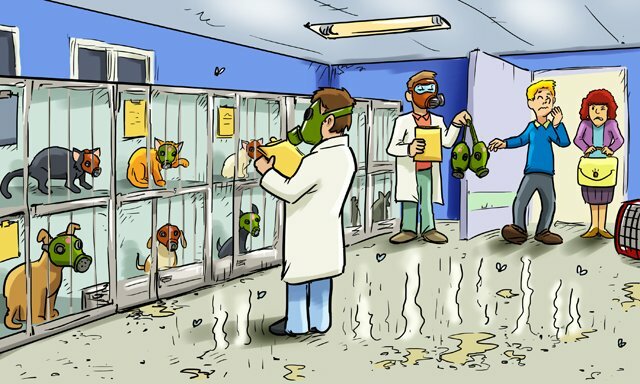 The good people at Animal Lovers Veterinary Clinic thought all it would take to keep their floors sanitary and safe from stink was a good, daily cleaning. What they didn’t anticipate, however, was the insistent presence of bacteria. It bred in the pores of their floors, and in the cracks, and in the seams, until it had conquered all clean scents and replaced them with a stench so terrible that the staff started considering the merits of introducing gas masks into their day-to-day operations. Cute ones. With paw prints. Ultimately, they decided to go with an Everlast Epoxy Floor. Seamless, non-porous, and formulated using an EPA-registered Anti Microbial additive which squashes the progression of bacteria and odors, it eliminated all their smelly problems and kept future ones at bay for years and years to come.